Two years ago I made my first post about my love of houndstooth. Fast forward to today and I'm still, if not even more so, in love with houndstooth. And I'm still in search of houndstooth fabric in 100% good quality wool in oversized scales. 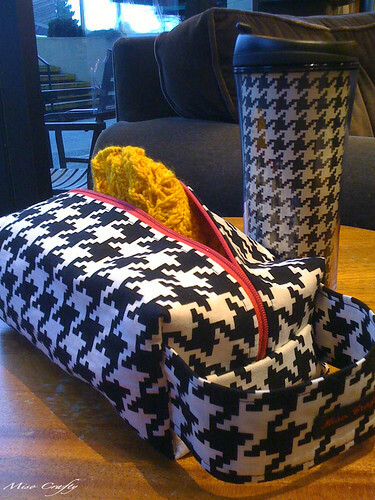 In the meantime I've been curbing my houndstooth appetite with small projects, such as the project bag and travel tumbler shown in the photo above. I have quite the stash of Paula Prass' Summer Soiree fabric in 3 of her colourways, but have always been a little hesitant on actually using it (lest I run out!!). I finally broke down and decided to make a project bag since: a) it uses a small amount of fabric; and b) I needed a project bag for a cardigan that I'm currently knitting up. Of course, I also had to line my bag in pink, after all, I am using my favourite print of all time! The travel tumbler is of the design-it-yourself variety, purchased last year with plans of being turned into a Christmas present for a grandparent. Obviously that didn't happen. So instead of letting it continue collecting dust in the cupboard I rummaged around my sewing closet and discovered the leftover paper from my Knit Kit. The paper was just big enough for me to draw the tumbler template on! This is my new fave travel cup to take with me to work and Toddler Time. I'm thinking of getting the Noro off my loom and try my hand at weaving my own houndstooth. While digging through my closet last week I came upon this once-was-a-favourite capelet and thought how even more wonderful it would be if it were in a jumbo houndstooth print. After a thorough inspection I think the capelet would be pretty easy to draft and simple to sew up. 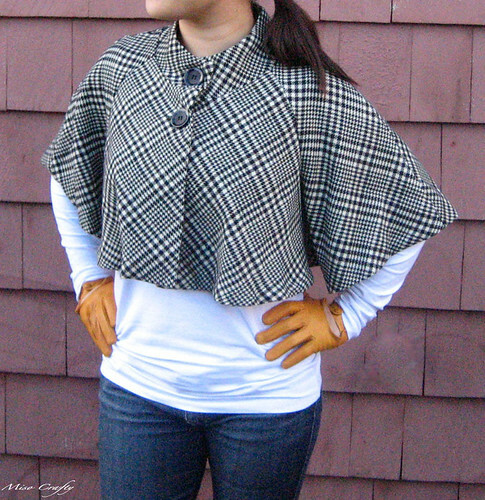 I wouldn't bank on seeing a new houndstooth capelet on this blog any time soon though, I would need to experiment with the weaving and try to find the right scale that I have in mind. Then I would have to weave up each pattern piece...yeah...this project idea will definitely take awhile! Hmm...I wonder how else I can get my houndstooth fix? I still have MAD need for a project bag. Please sell them! PS. See you tonight at knit night? I will 100% be there this time - there is no stopping me!!! Awww...thanks Mae! Actually, I will be opening up an etsy shop pretty soon...so I will be selling the bags. You better be at knit night next week...since you weren't there this evening!